Find hotel near Parcul Alexandru Ioan Cuz ..
At 85 hectares this is one of the largest parks in the city. It surrounds the Lake Titan. The main attraction here are the 5 islands in the middle of the lake - Pensioners’ Island, the IOR Island, the Roses’ Island, the Drowned People’s Island and the Dogs’ Island. It is often commented that these cutesy names alone account for the park's popularity. Nearby there is a Pentecost Church in Maramures style. Surrounding the park are innumerable cafes and bars and restaurants. Inside the park are innumerable sports facilities for football, tennis, handball, basketball, volleyball. Check out the kids playground too. 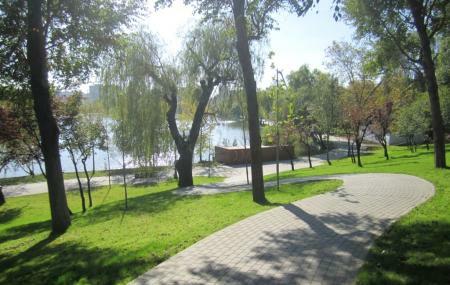 There is a running and cycling track 3.5 kilometers long around the lake. There is a pretty waterfall. How popular is Parcul Alexandru Ioan Cuza? People normally club together Carol Park and Coltea Hospital while planning their visit to Parcul Alexandru Ioan Cuza. It's very nice park. Green and blue together. You can go with your friends or family. Nice place for picnic with a group. There are several activities you can perform there such as renting bike, you can ride boats, I even saw some people swimming there. But it doesn't look that clean to swim so I don't recommend it for swimming. There are plenty of animals in the lake you can watch them. Great park, it came a long way. It''s in its best shape of the last 25 years. Perfect place to jog, walk around and enjoy nature. Nice park, very crowded in weekends. Large lake with lots of playgrounds around it. A mall on the SE side if one wants to avoid the junk food and park toilets. The area towards the metro statio (Titan) is wild and should be avoided during the night.